Well I am done tinkering with the looks of the blog for now. It needed a little more visual appeal, and while I liked the layout a bit better on the other, this version gave me the option of doing a custom header. I will be using that custom header to switch out photos of new designs as they come available. I so love Adobe products. I am not all that keen on the fat links above the banner, but when you don’t design it yourself, you take what you can get. Personally, I think it competes with the header a bit. We don’t host our blogs ourselves, they are on WordPress’s site. They can be hosted on our web site but we have not investigated that and frankly I don’t know how the transition works, whether or not the content already on WordPress would be lost or not. At any rate, that is it for the blog. New designs coming out: Sugar and Spice, a baby blanket, and Animal Crackers, a set of baby sweaters, are in Knitted Gifts by Ann Budd, published by Interweave. I saw the advance copy at TNNA so the book will be out shortly. It has a lot of really great projects in it, just like Simple Style. Simple Style of course has not been out that long, and I have a design in it. Again, it is by Ann Budd and published by Interweave. Kazumi is the name of the design I have in it. Bramble Berry All Seasons was shown at TNNA for those of you in warmer areas (or who don’t want a worsted weight wool sweater). Knit out of Merino Cotton 90 from Schulana, distributed by Skacel, it is the lovely red violet sweater in the banner above. It is the first of the worsted weight wool designs being redone and released in either a Cotton Wool blend or a DK weight yarn (which is like a light worsted). All of the original worsted weight wool designs will continue to be carried as well. Lush and Calliope were also previewed at TNNA in the booth of my distributor Up North Fiber Art Supply, and they pre-ordered all three new designs. I will be photographing those today and will write up a feature on them like I have for my other designs. If you would like to see the fashion show from TNNA this summer, they post it on you tube. It is hosted by the Yarn Group. I thought it was well done, and attended with the ladies from PatternFish. I met Julia last year at TNNA, and I will be offering pdf downloads of all my patterns through PatternFish. As they become available on pdf I will announce it on my blog. There are still a few shops that are resistant to designers offering pdf patterns. For designers, it is another way to offer our designers to customers, in a format that a segmant want. From the conversations I have had with other designers, it seems that shoppers tend to fall into these groups: those who don’t go online and always purchase from B&M (brick and mortar – any retail shop), those who purchase from mail order and online, with those who purchase online being as likely to order a download pattern as a hardcopy. It is that online segment that doesn’t want the paper copy that I am trying to be able to reach. Those customers are not likely to purchase a paper pattern. What others have found is that when paper patterns are displayed well in the shops, the patterns tend to do well also. If the patterns are shoved in an obscure corner where they can be forgotten about, they don’t do as well. There is a certain amount of marketing responsibility on the shops for their own product. A pattern in itself can be a good impulse purchase leading to a yarn sale. Some shops even display new patterns with a hot new yarn, where they can be seen together. One shop had a felted purse with some patterns for the purse stuck in it. The wondered why they had trouble keeping the pattern in stock. I recently had someone in Norway contact me regarding a design of mine and wondering if it were available in pdf format. I told her not yet, but soon. The prices on PatternFish will be the same as the other retail outlets, as PatternFish is essentially like selling patterns to another store and they in turn sell them to the customer. They, however, sell the digital format with the ability to provide some security to the pdf and take care of all the details that go with that, along with tracking sales and so on. They earn their percentage. There will be a link on my blog when the patterns go live on PatternFish. I won’t name any names as it is too early, but I will tell you that I have begun to go over my book submission as I am going to be submitting my proposal to another publisher. A contact that I know in the business is going to look at my proposal and I am frankly nervous. I have not talked about my book idea in a long time, and for those who don’t remember it, the idea for the book is simple: all of the designs are inspired by animals at the zoo. Originally it was our local children’s zoo, but over time and travels there have been a couple things added that are not from our local zoo. For those who are familiar with my designs you know that none of my work is representational, it is all abstract. Zambesi River and Squirrel Monkey are both examples of designs inspired by animals. I originally came up with the concept a couple years before Handknit Holidays came out, and had shown all of the swatches to Ann Budd as well as Meg Swansen (I went to knitting camp when I turned 40 with Katherine Misegades, I am now 45). Various people in the industry have seen the swatches and loved the concept. I submitted the book to Interweave, but the editor in the book department at the time did not feel knitters could relate to a book that had animals as the inspiration. If I had changed the concept to include other things, it might have been a different story. However, I can see a whole series of books, either Inspired Knitting or a Knitter’s Travelogue and then different subtitles. A book for example with designs inspired on the architecture of Frank Lloyd Wright in Chicago. A book on Sacred Places (I have a design already that is inspired by Arlington Cemetary with some wonderful photography). The Great Lakes, Route 66, Eclectic Architecture. I went through my computer and printed off a whole stack of papers that I will be going through and makeing sure there isn’t anything I want to change. I went through my swatches the other day and sorted out which ones I want to re-knit in a different yarn, as I have yarn support now and want to use yarns from different yarn companies that are so generous and helpful. Skacel, Plymouth, Trendsetter, and Dale are all ones I would like to thank for various reasons. It it were not for Trudy VanStralen (Louet Sales) I would not be a designer today. I did my first professional design for them, and she was very encouraging, followed closely by Black Water Abbey’s Marilyn King. Marilyn is a wonderful woman and I treasure her dearly. I am at a point in my design career where I am trying to make my patterns more widely appealing though, and part of that when you market to yarn stores is having designs offered in yarns that are available wholesale. So I am doing two versions of many of my designs, a worsted weight version in Black Water Abbey and then another version in either a different worsted weight wool, or a different weight yarn or different fiber. I am looking at having some of the same patterns be a better fit for southern states by using more all season blends and lighter weights (Schulana Merino Cotton 135 is a DK weight Merino Cotton, for example, and they have a Merino Cotton 90 which is a Worsted Weight according to the web site). Calliope (New Leaflet) knit in Lyndon Hill from Plymouth Yarns, Bramble Berry and Lush (New Design) knit in Schulana Merino Cotton 90 from Skacel, Harvest Spice (New Design) knit in ShiBui Knits Silk Cloud, Elizabeth I knit in Claudia Handpaints Silk Lace. Here are a couple pictures of the Red Crowned Crane that I took at the San Diego Zoo a few years ago. I went up this path/road, and there was this bird that was bigger than a small child. It was quite inquisitive and friendly, and I think it was one of my favorite parts of the trip. I am working on a design inspired by this bird, where it will be published I cannot disclose yet. When I know I will let you know. Unfortunately, I cannot share details on yarn and stitch pattern yet either. I can tell you that I am looking at fine gauge yarns, however, in fibers that drape. I love the look on his face here. This bird is a very striking bird, and you don’t get the sense of that really from this angle but this is a more of what I would call a portrait shot. Distinguishing characteristics are lovely black plumage at the tail, black neck and feet, and the scarlet spot on the top of the head. I don’t actually know if this is a male or female. I could go with a slick yarn, like Euroflax linen, or a blend like Terra from SWTC. I think something along those lines would suit the design best. It could have a very slight fuzz to it, but not a lot. I want it to have good stitch definition. This is a very shapely bird too. I am pictureing a comfortable garment, not too structured but not too baggy. Too highly structured would not feel right, anymore than having something with no shape to it. Cranes are symbolic in many Asian cultures. Red Crowned Cranes are supposed to be symbolic for Longevity, Marital Fidelity, and Luck. They are also symbolic of Immortality and nobility. This crane is also called the Japanese Crane or Manchurian Crane, is 55 inches tall, and can weigh up to 22lb (although some males have been up to 33 lb). The scarlet patch on top of their head gets red whenever they are angry or excited, although this bird seemed so calm the whole time I was there I never would have guessed either was the case. I wasn’t making any noise, and I was the only person there. It was quiet, and I wasn’t flapping my arms or trying to gesture or call to it. It walked right up to me and turned it’s head, this way and that. We had a Zen moment. At least I did. 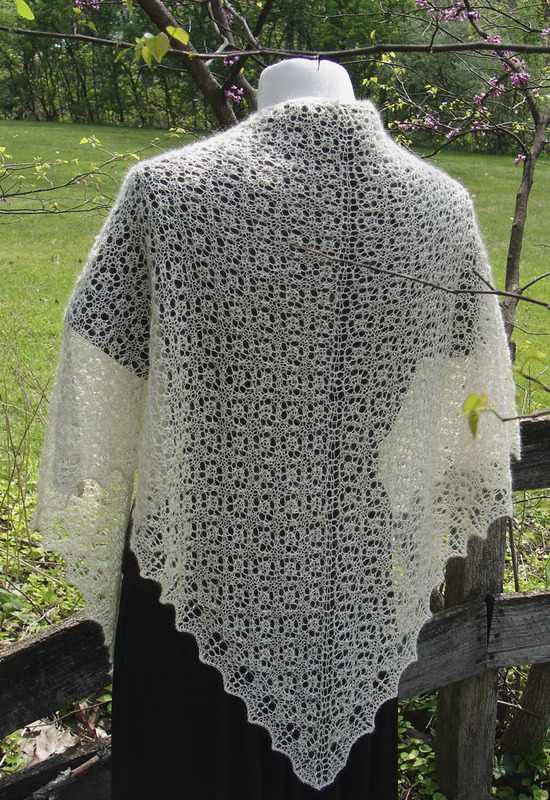 Hot of the design table, here is Forest Park…a dresser scarf knit out of Suri Elegance (a laceweight alpaca). This design was submitted to Storey Publishing, for the call for submissions for the second One Skein Wonder book. The design came about from my desire to have a piece of lace for my dresser, that would be antique looking as well as modern. I took for my inspiration the works of Frank Lloyd Wright, as seen in Oak Park, Illinois, and River Forest, Illinois. His first home and studio (as an adult, married man) was built in Oak Park, and this home as well as many of his other early works can be seen in this neighborhood. His early works were not in the Prairie style, but were more in the prevailing style of the day. His work evolved into what we know as Prairie Style. There was a connection between the home and the land it was situated on in Wright’s style. His own home overlooked what was in the time it was built undeveloped prairie. In choosing a yarn, I wanted something that was delicate and airy, so I knew I would want a true lace weight yarn. I also wanted a luxurious natural fiber. The natural fiber would be necessary as a design element in that it reflected the aesthetic of the Prairie Style that Wright pioneered. Since this was a decidedly elegant and fancy piece, in that it is finery for my dresser, I wanted it to have a bit of an opulent feel. The lace weight Alpaca thus satisfied the need for a natural fiber and the luxurious feel that was wanted. The yarn has a little bit of a fuzz as well, which gives it a different feel than if it had been a slick yarn such as silk. It is at once elegant and casual, and fits in perfectly in my 100+ year old home. The fuzz gives it a warmth that fits in well here. If I had a sleek modern apartment, I would probably have gone with silk, depending on my furnishings. This will eventually come out in pattern, whether it appears in the new book or not. I have not heard back yet whether it will be included or not. A lot depends on what other items are going to be in the book, as a submission may be beautiful but just not fit with the other items that were chosen. I will let you know when it will be out, but until then you can enjoy the picture. I have been somewhat slowed down since my accident last March. Things are on the upswing now, and I thought I would share some pictures with you of things that are in progress. This blue swatch, Clover, was knit out of Colorado, a yarn by Interlacements. I am writing the pattern directions now and hope to get it off to the test knitter soon so it can be ready for Stitches East. Interlacements carries another of my designs, Squirrel Monkey, and they are very nice people to work with. Garment details include a scoop neck, short sleeves (I have not decided between raglan and set in sleeves yet), and a Channel Island cast on. Length is high hip length. I may submit this to Knitter’s magazine, as it would fit in well with their call for submissions right now. The pink swatch is Sweet Pea. Sweet Pea is a lace camisole, sized for little girls and adults. I have not worked out the sizing yet, so have I not started the pattern writing. I am thinking of doing three separate patterns, one for children, one for teens, and one for adults. I am going to at least do the pattern for children.Garment details include Channel Islandd Cast On, garter stitch bands, and scoop neck. Length would be standard sweater length. The yarn is Dale of Norway Stork, and I am going to swatch it in Catania before making a decision on which yarn to use. Catania is similar in weight to Paton’s Grace. The last swatch I am showing is for the border of a shawl, Thistle Leaf Lace. This shawl is simply beautiful and is constructed much the same as the Evergreen Shawl that I did for Melanie Falick’s Handknit Holidays book. The swatch was knit with a lace weight wool (I don’t remember whose). I will be having it knit out of a lace weight alpaca, Suri Elegance. I also love Fino, but will be using the Suri Elegance for this one. The design is a very personal one for me, as it is a celebration of a loving friend whom I have mourned deeply. It is my prayer shawl for their passing. And more than the grieving process, it is a reflection of how the relationships with have in our lives make our lives richer and fuller, even when those relationships have ended. There are any number of lace yarns that this would be beautiful in. Treenway Silks have some wonderful Silk and Yak, Silk and Cashmere, Silk and Angora, Silk and Camel, Silk and Wook, or just plain Silk. Helen’s Lace from Lorna’s Laces is wonderful, as is Zephyr.